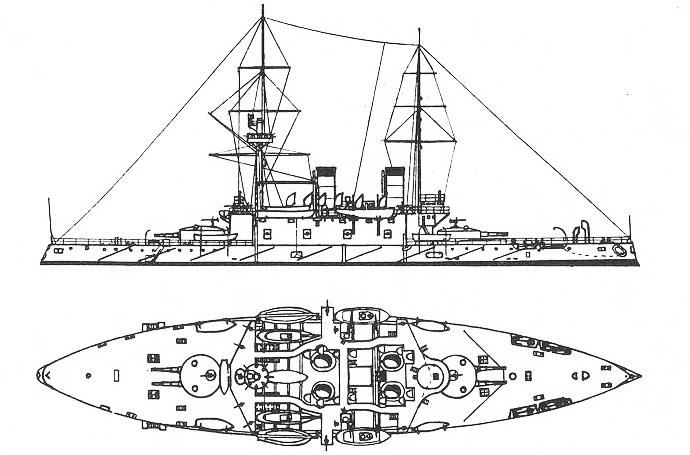 One of the rare Russian battleships which was sunk in action in 1905 rather than captured or shelled in Port Arthur, the Navarin was singular in more than titles: Besides four funnels in two tandem pairs because of her unusual machinery arrangement -which had her nicknamed “Zavod” (factory)- she was also heavily armoured. But machinery flaws created massive construction delays while costs rose and the Navarin was already obsolescent when in service by 1895, whereas the first trials took place in… 1891 (before launch). Built in the Franco-Russian Works of Saint Petersburg, she remained unique. Ordered 24 April 1889, laid down on 31 May 1890 and launched on 20 October 1891, in service by June 1896. 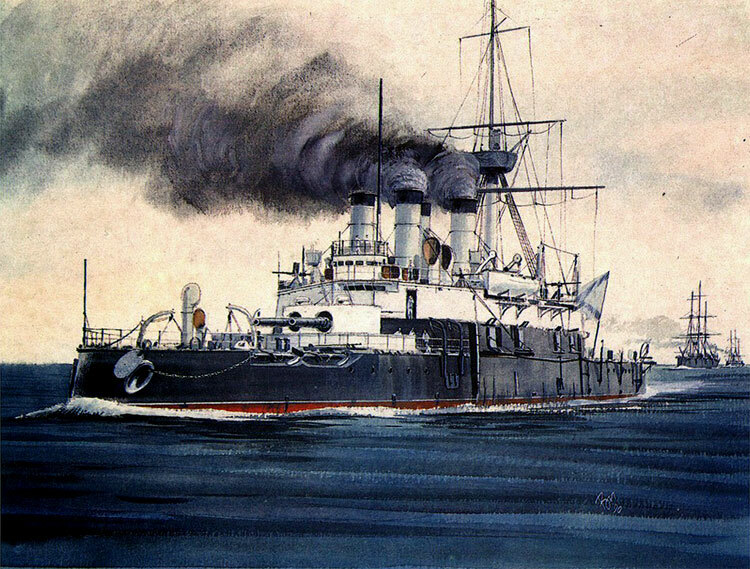 The admiralty specified she was capable of operating “in all European seas and by its coal capacity to reach the Far East.” It seemed a perfect fit requirement for the upcoming battle of Tsushima, where precisely the Western Russian fleet was obliged to make a perilous and long journey throughout the globe to reach Port Arthur, trying to lift the siege. The design was also revised with the replacement of the original main artillery by more powerful guns of the same caliber, while the secondary artillery rose from six guns to eight guns. The ship name “Navarin” came from the naval battle of Navarino which took place in 1827 against the Turks, supporting the Bulgarians and part of the Greek War of Independence. Typical of the pre-dreadnoughts of that time, the Navarin was wide, slow, heavily armored and armed with the usual twin turrets with 12 in artillery, secondary 6-in guns and light anti-torpedo boats guns. Powerplant of the Navarin was somewhat eccentric, with a pair of three-cylinder, vertical triple-expansion steam engines, each driving a propeller shaft. Total output (as designed) was 9,000 indicated horsepower (6,700 kW). Steam came from 12 cylindrical fire-tube boilers. Pressure was 9.4 atm (952 kPa; 138 psi). What really made it special was the localization of the the four boiler rooms, arranged in two pairs abreast. Therefore each had its own independent funnel. 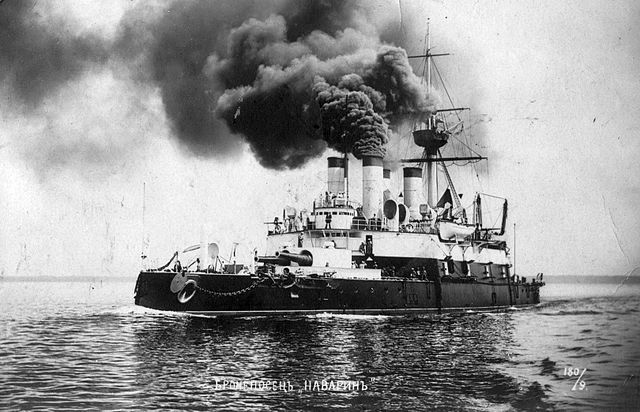 This very unusual arrangement resulted in two pairs of funnels and the ship soon earned the nickname “factory” (Zavod). However on trials, the constructor was shown even after firing the first batch of boilers, in May 1891 the designed steam pressure could not be met. The enquiry revealed numerous flaws in their construction, as Russian production fundry standard were still quite low at that time. The admiralty therefore requested the yard to replace the boilers at their own expenses, and this delayed the tests until August 1893, two years after. Still at that stage, steam pressure was found inadequate. Again, the factory was asked one more year to rectify these issues. 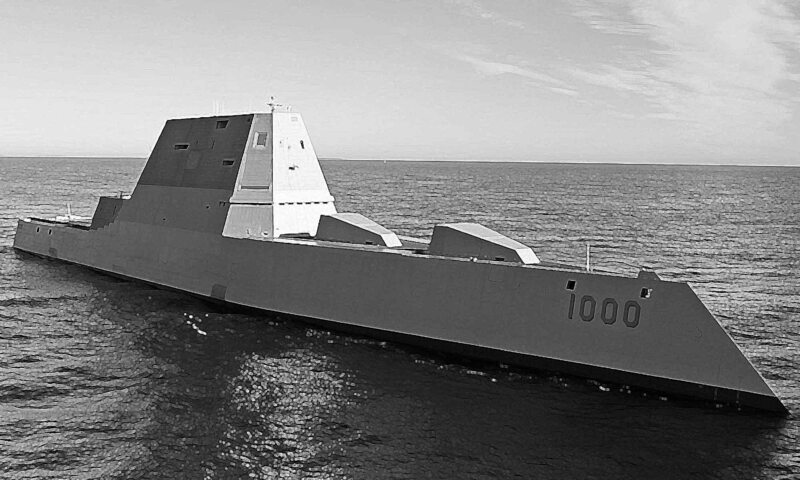 The final sea trials took place in… November 1895. She reached a top speed of 15.85 knots (29.35 km/h; 18.24 mph), still a bit less that design requirements (16 knots) but at that stage these figures were accepted anyway. One of the key requirement, the range, however was met, as Navarin carried up to 1,200 long tons (1,200 t) of coal in numerous compartments that also acted as supplementary ASW protections. At full load this traduced by 3,050 nautical miles (5,650 km; 3,510 mi) at 10 knots (19 km/h; 12 mph). 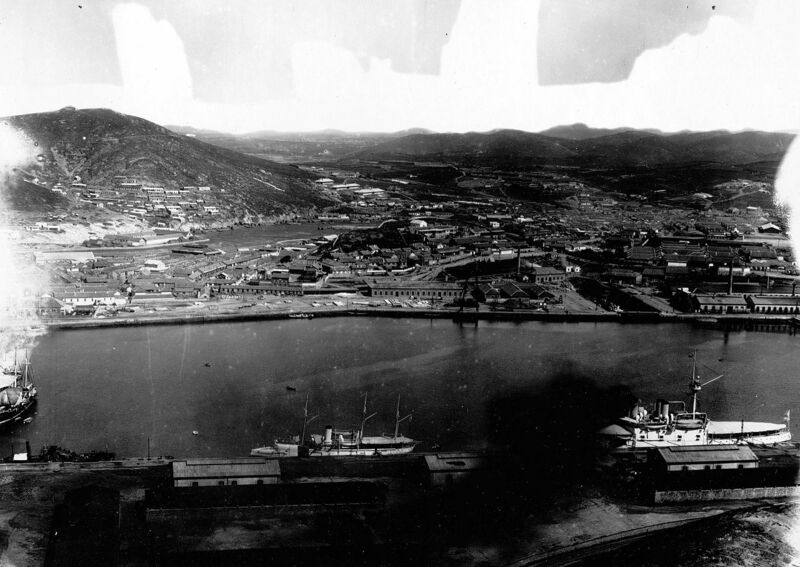 This was however only a fourth of the required radius to join without stop the far east: In 1905 the Russian fleet’s trip was 18,000 nautical miles (33,000 km) -agreed with some imperities, as to be banned from using the Suez Canal. Navarin was armed with two pairs of 12-in (305 mm) Obukhov Model 1886 35-caliber guns. They were mounted twin-gun turrets fore and aft of the main superstructure. Both were powered hydraulically and the forward one had a 243° firing arc, 214° for the rear one. Top rate of fire was measured as two minutes 22 seconds. Standard light HE shells were 731.3-pound (331.7 kg) at 2,090 ft/s (637 m/s). Individual provision was 80 rounds per gun, so 320 total, including armor-piercing and dummy exercize rounds. The secondary armament was not particularly impressiven, with only six 6-inch (152 mm) guns, Pattern 1877, 35 caliber. They were were mounted in superstructure’s casemates and their standard 91.5 lb (41.5 kg) shells’s muzzle velocity was 2,329 ft/s (710 m/s). They could reach a target up to 8,170 yards (7,470 m) afar at 12° elevation. Total provision was 1,600 rounds. -Fourteen QF 47 mm (1.9 in) Hotchkiss guns, all mounted in the superstructure. Their shell was a standard 3 pdr (1.4 kg) model, existing the muzzle at 1,867 ft/s (569 m/s). -Eight Maxim QF 37 mm (1.5 in) guns, light and commapct enough to be mounted in the fighting tops. Four were left apart to be installed in the forward position of boats for amphibious assaults. Their shells were 1 pdr (0.45 kg), 1,319 ft/s (402 m/s). Also for close-quarters, Navarin carried six 15-inch (381 mm) torpedo tubes, all positioned above water in a typical “lozenge” formula (one bow, one stern, two abreast). Provision was 12 reloeads. Compound armor was used on all the ship for vertical surfaces but regular nickel steel for the gun turrets. The waterline armor belt was a remarkable 16 inches (406 mm) thick, reduced to 12 up to 14 inches (305–356 mm) above the magazines, covering 228 feet (69.5 m) on 7 feet (2.1 m) in height, tapered down to a 8 in (203 mm) for the lower edge. Better still, the upper belt section was 18 inches (457.2 mm), originally above the waterline, but sine the ship was overweight, it fell below. Tranverse bulkhads 14–16-inch (356–406 mm) closed the citadel box. The lower casemate was 218 feet (66.4 m) long, 8 feet (2.4 m) high with 16-in sides It was closed by 16-inch transverse bulkheads. The upper casemate was 5 in (127 mm) thick. The turrets were 16 in (406 mm) thick on the frontal arc. The conning towers on both ends of the casemate had 12 inches (305 mm) walls. 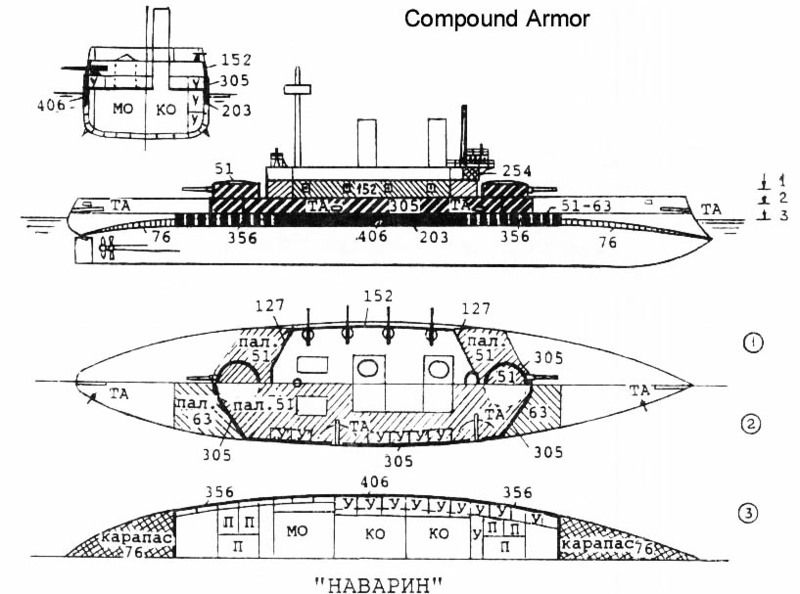 The armor deck range from was 2 in (51 mm) over the lower casemate up to 2.5 inches (64 mm) thick above the main armor belt. 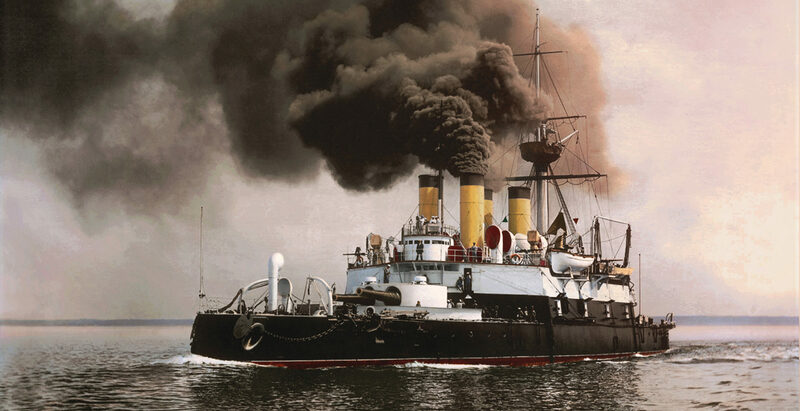 After years-long delay the ships was in service with the Baltic Fleet in 1896. She sailed for a goodwill cruise in the Mediterranean from August that year, visiting the Piraeus in October but was soon ordered to join Sissoi Veliky and race to the Far East in early 1898. She was at Port Arthur in March, taking part in the Boxer Rebellion repression two years after. Together with her mate Sissoi Veliky and cruisers she was back to the Baltic on 25 December 1901. She was in September 1902 taken in hands for a refit, cut short when Russo-Japanese War broke out in February 1904. She however had the tome to be fitted with brand new 4.5-foot (1.4 m) Barr & Stroud rangefinders, and telescopic gun sights plus German modern Telefunken radio. She also received four extra 3-in (75 mm) guns, taking place of superstructure top four 47 mm guns relocated on both turret roofs. By October 1904, she departed for Port Arthur with the ad hoc Second Pacific Squadron (Admiral Zinovy Rozhestvensky). At Tangier, she was part of the splitted forces proceeding through the Mediterranean and Suez Canal, heading for Madagascar to join the lighter cruisers, racing along the coast of Africa. 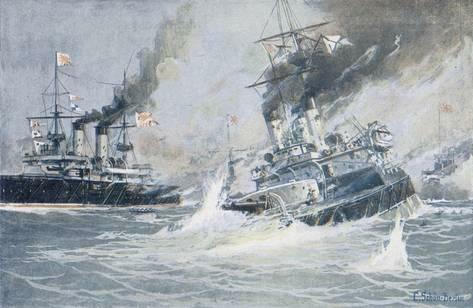 Both forces met at Nosy Be on 9 January 1905 and later sailed to Camranh Bay, (French Indochina) in March 1905 and then joining forces with Rear Admiral Nikolai Nebogatov’s 3rd Pacific Squadron and Vladivostok in May. 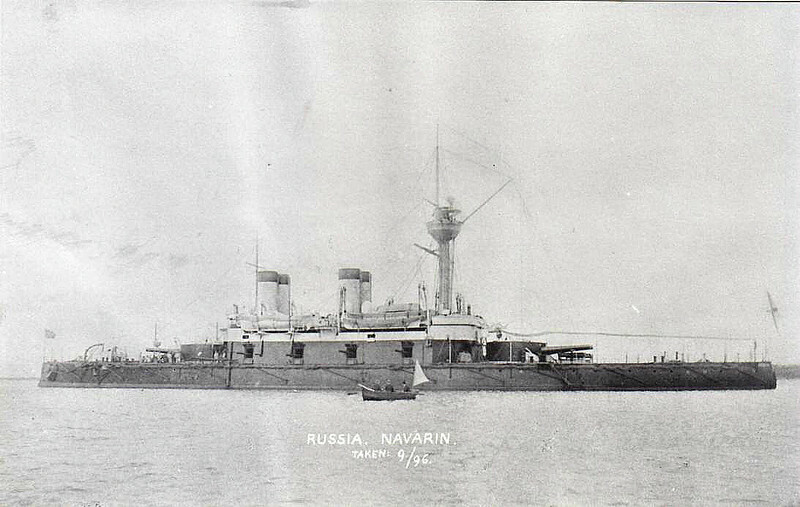 Navarin was part of the second naval division with older ships, under von Fölkersam (Oslyabya, Navarin, Sissoi Veliky, Admiral Nakhimov). However Von Fölkersam died from cancer on 26 May and Oslyabya’s captain took his place. 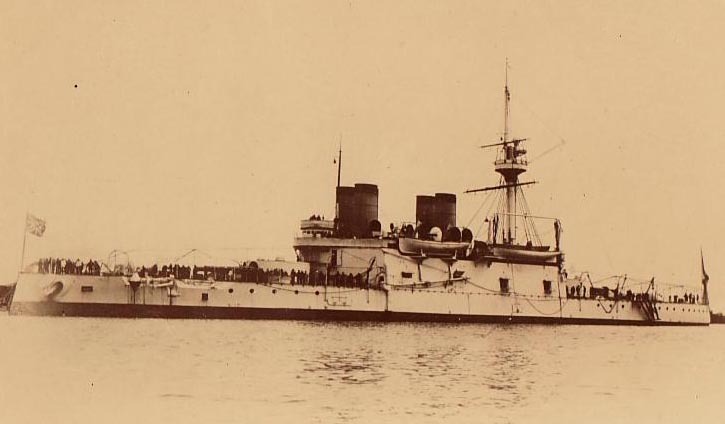 On 27–28 May Navarin apparently was not heavily engaged, at least in the early part of the battle of Tsushima However later that day she was third last in the line of battle, and concentrated fire took its toll. She was badly hit by four main caliber shells on the waterline. This caused massive flooding aft. Her quarterdeck sank to the level of the aft 305 mm turret in the evening at 21.00. The captain ordered a full stop for the teams to repair her, but unfortunately at that time, the fog has lifted and despite the night falling, she was spotted and attacked by Japanese torpedo boats. They probably launched all their torpedoes and hit the Navarin one or two times. According to “Clouds above the Hill: A Historical Novel of the Russo-Japanese War” (Volume 4) by Shiba Ryōtarō, Admiral Suzuki’s TBDs Asagiri fired a torpedo volley at 600 m and Shirakumo at 400 m, leaving to chance to the crippled, semi-submerged ship to change course. Sissoi Veliki almost sank too. Despite this, heavy light artillery fire repelled the Japanese ships, badly damaging one of these ships, while the teams succeeded in preventing more damage and Navarin was soon able to sail again. However around 2 o’clock in the morning, she was again spotted and caught, this time by the Fourth Destroyer Division, already damaging the Sissoi Veliki. Rather than engaging her by artillery and torpedo fire, they simply laid a string of mines ahead of her course, four mines linked with cables whih ensured the prow would draw the mines onto the ship to detonate. Two of these “flying mines” indeed ended as such, hitting the Navarin. This time, the damage was enormous and no damage control could be achieved, she capsized and sank, carryong with her all of the crew but the 70 men lucky enough to be on the deck or nearby an access when she sank. However only three were alive when they were found, some 16 hours later, either by a Japanese torpedo boat or a British merchant ship because of the cold and exhaustion. There has been also allegations of Japanese TBs firing on them when crying for help. But this was a dramatic end anyway. The wreck has never been found as no expedition to uncover the true extent of the damage on the ship was done.